Supports almost all popular HD and SD video formats. Supports 280 portable and media devices including Android, iOS, Windows phone, Xbox and plays station 4, etc. Create photo slideshow and video with pictures. Offers vivid video editing features. Download music videos and HD videos from YouTube. Support of multi-core CPU for faster video conversion. MacX HD Video Converter Pro compatibility with Windows 10 (32& 64 bit), Windows 8, Windows 7, Vista, Windows 98, NT, 2000, 2003, and Windows XP. MacX HD Video Converter Pro normally cost $59.95 per single license key. 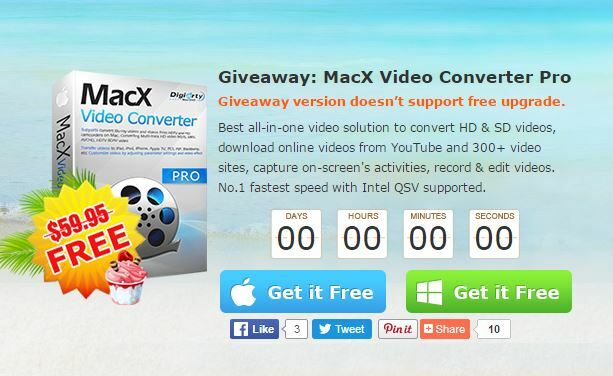 As part of promotional offer, Digiarty Software, Inc. is now giveaway full version of MacX HD Video Converter Pro for Windows and Mac at no cost to everyone. Offer valid till September 01, 2016. Visit the official giveaway promo page here. Click “Get it Free” button for either Windows or Mac to grab the free license serial number & download link. Now click the download link to download MacX HD Video Converter Pro. Once complete download and install, activate MacX HD Video Converter Pro to full version with license serial number before September 2, 2016.